With the ANZ bank closing its doors in Thirroul, Horizon Credit Union is reminding us they provide the Northern Illawarra with a quality banking alternative – PLUS they’re hosting a FREE screening of Finding Dory at Thirroul Beach Reserve on Saturday November 18. 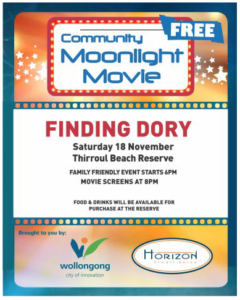 To cement their commitment to the Northern Illawarra, Horizon and Wollongong City Council will host a family moonlight movie night at Thirroul Beach Reserve from 6pm on Saturday November 18. Food and drinks can be purchased at the reserve. There will be fun and activities for all the kids. Need A Feed? Visit the Pan-crepe Bar!